Matthew Slone and Lorenzo Green. 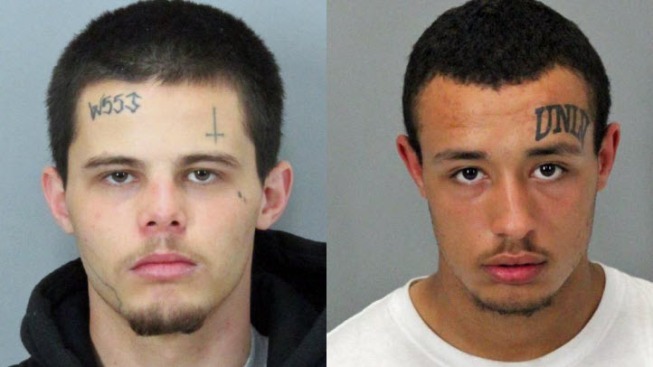 Two men were arrested Thursday in South San Jose on suspicion of committing an armed robbery at a light-rail station. The robbery was reported just after 11 a.m. at the Blossom Hill Santa Clara Valley Transportation Authority station. The suspects, one armed with a gun, allegedly approached the victim and demanded her items before taking them and fleeing on foot. Transit patrol deputies searching for the men spotted them in a residential neighborhood just north of the station and arrested one of them, 20-year-old Matthew Slone, without incident. The other man, 18-year-old Lorenzo Green, ran off, jumping over residential fences toward the Kinderwood Children's Center. Deputies requested that the center, as well as nearby Del Roble Elementary School, be locked down because they believed Green was armed. After deputies found Green hiding in a garbage can, they lifted the lockdowns at both schools just before noon. With the help of a K-9 unit, deputies found the gun and other evidence nearby. Both men are being held without bail and will be arraigned on Monday afternoon.